Brent and Geranne Rasmussen of Cowley purchased the 5,000th brown and gold license plate from the UW Alumni Association. Plate sales help fund scholarships for Wyoming and out-of-state incoming freshmen students. The University of Wyoming Alumni Association recently issued the 5,000th brown-and-gold license plate that funds scholarships to support UW students. 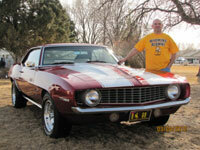 Brent and Geranne Rasmussen of Cowley purchased the milestone plate "9-69" for Brent's classic 1969 Camaro. "We saw the plates around town and thought it would be neat to have one," Geranne Rasmussen says. "Our friend, Glen Scheeler, who has five plates on his classic cars, told us to fill out an application through the UW Alumni Association. When we found out it supported scholarships, we thought that was even better. I attended college on scholarship, and it's a great way to give back." The plates were designed to fund scholarships for incoming freshmen students, both from Wyoming and out of state. Since the program started in 2007, 64 students have received scholarships to achieve their higher education goals. "The Alumni Association scholarship has been very helpful as I pay my way through college," says Ben Collamer of Saratoga, a 2010 scholarship recipient majoring in civil engineering. Owners of vehicles who want to register or renew their registration may submit applications available at http://www.wyoalumni.com/licensePlateProgram.html. A one-time fee of $130 is required with the plate application; $100 of the fee is restricted for student scholarships and programming expenditures. For more information or to purchase a license plate, call UWAA at (307) 766-4166.